Jazz Station - Arnaldo DeSouteiro's Blog (Jazz, Bossa & Beyond): Book of the Day - "Phil Kraus: Modern Method for Four Mallets"
Book of the Day - "Phil Kraus: Modern Method for Four Mallets"
For vibes, xylophone, and marimba. Proper holding technique, up and down strokes, striking, pedaling and muffling are all studied. 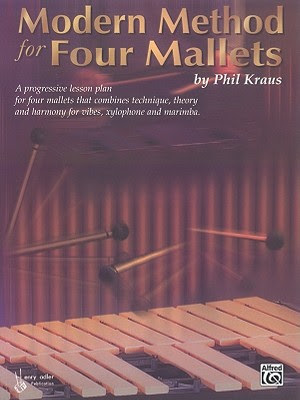 The bulk of the text is dedicated to in-depth harmonic lessons that are designed to reinforce proper techniques and advance improvisation skills for four-mallet performance. A must for keyboard percussionists of all styles of music.